Triple Diamond Plastic 48x45 Collapsible Bulk Containers with 2 drop doors incorporate durable sidewalls and high-strength base. 4-way forklift access for secure and efficient handling. 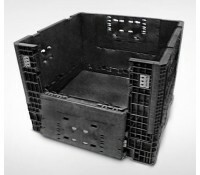 These plastic reusable bulk containers are structural foam, molded of tough, durable high-density polyethylene for long-life performance under the harshest conditions and provide excellent product protection. 47.9" x 44.9" x 25"
47.9" x 44.9" x 34"
44.3" x 41.5" x 28.5"
47.9" x 44.9" x 42"
44.3" x 41.5" x 35.7"
47.9" x 44.9" x 50"
44.3" x 41.5" x 44.3"